While we were down in Page visiting Squire's family just a couple weeks ago, we found pictures from the day Squire proposed on Mamma Hepworth's camera card! And so, to commemorate that special day -- May 9th, 2008 -- I'm sharing our proposal story. One of my last photos as an unengaged woman. We (Squire, Mama Hepworth. Grandma and Grandpa Tripp, and I) all got up, had a yummy breakfast and left to go on a "Dam tour" (think Griswold Vegas Vacation) - the Glen Canyon Dam tour to be specific. Squire was snapping pictures of me all day - the above picture is one Squire took of me, before we left the house. We all enjoyed the Glen Canyon dam tour, but Squire - now that I think on it - was a bit antsy all morning. Especially when it was time to leave to go "fishing" as he had informed me we would be doing after the tour. On the Glen Canyon Dam tour. G-ma Tripp, some tourists, Mamma Hepworth, and G-pa Tripp. Right before we left for Paria, Squire told his mom for the first time that he would be proposing to me! He hadn't told her sooner, knowing that she would let it slip in her excitement. She never was the secret-keeping type. She squealed with delight when he showed her the ring, and then left with me in the car, not having seen the exchange. One last picture before we left to go "fishing!" Squire says that on the way over to Paria, I kept asking him, "What are you thinking about? Are you ok?" And of course he just said, "Oh nothin'." He was just excited to get that ring out of his pocket! Swimming around in "Trace Lake" at Paria. Not before too long, Squire suggested we get into the little row boat and go "fishing". Although, as we got into the boat, we just left the fishing poles in the car. Squire informed me that there was a "fish trap" located at the bottom of the pond, and that we should pull it up to see what if we had caught anything. Now, I had never heard of a fish trap before, but I hadn't ever been fishing either so I just decided to go with the flow. We rowed to where the floating empty milk jugs marked the fish trap. (Although, it was quite difficult, seeing as how the wind was blowing hard against our direction of travel, and our paddle was really just a thick branch with a short board nailed on one end.) But we eventually made it and once we did I grabbed the makeshift buoys out of the water. I pulled and pulled and eventually got to the end of the rope, and there was a little wooden treasure-chest-looking box that had been wrapped with bailing wire. I thought it was suspicious that Squire had wire-cutters all ready to cut open the box but also a little funny that in the case this really was a fish trap, someone was awfully protective! "Your golden opportunity is coming shortly." "You will receive an offer you cannot refuse." "Tell someone you love how you feel about them." The last fortune cookie I opened had a fortune that was folded into a heart. I recognized it as the fortune Squire had received at dinner group about a month earlier. Everyone had teased Squire when he took his turn reading his fortune aloud to the group, "Buy someone a thoughtful gift of love." "Oooh! So when are you going to get Jami a ring?!" they had questioned him. Squire had just smiled and blushed a little then (and even given me a bread tie with some plastic jewel he'd found on the ground to wear as a joke after that evening), but at that moment when I read the fortune, I knew the big moment had arrived. Squire got down on one knee in the little boat, with the ring box open (which he had had in his backpack all along), and asked me if I would marry him. I said, "Yes Squire, I will marry you!" And then we just hugged each other and I cried for a long time. After quite some time, Squire said, "Don't you want to look at the ring?" "Oh! Yes!" I exclaimed. I forgot that part of the deal! :) I loved the ring - which Squire had picked out all on his own. We kissed and laughed. Squire told me how his dad had sunk the box in the pond the night before when we had arrived in Page, and I told him how relieved I was to finally have a ring and an official fiance, seeing as how I already had purchased my wedding dress . . . (I know, I'm bad.) Hehe. The obligatory, posing with the ring shot. Not too long after the proposal had been spoken, we were on our way back to Page - unused fishing gear in tow. What a wonderful day that was, and just over three years ago! It is soo cute! I wouldn't expect anything less from Squire but great! You two are a dime! very romantic. 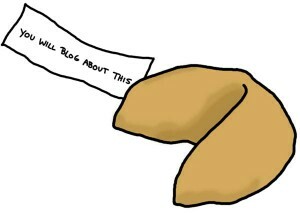 Greg did the fortune cookie thing, too. But then he also told me our marriage would be built on deception and lies that day, too, as he had to be sneaky that day.